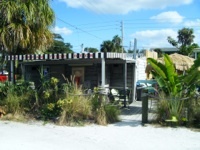 On the beautiful barrier island of Indian Rocks Beach, there is a little bamboo-covered cafe. 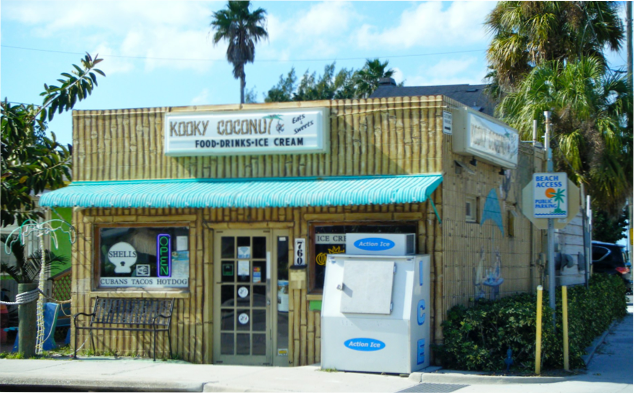 Located within steps from the 8th Avenue beach access to the Gulf of Mexico, Kooky Coconut serves up delicious authentic hot-pressed cuban sandwiches, fresh burritos, tacos and quesadillas, tuna salad and a variety of other beach-friendly eats. Drink choices are just as varied, from a variety of beers and wine, to Coca-Cola products and energy drinks. Hot bodies are cooled down with more than 20 ever-changing flavors of homemade ice cream from local Tampa Bay creameries, including Toasted Coconut, Vanilla Bean, and Superman, as well as sugar-free ice cream, soft-serve ice cream, and a non-dairy Mango Sorbet. Or indulge in a hot-fudge sundae, banana split, milkshake or malt. The friendly staff at Kooky Coconut Cafe is sensitive to food allergies, and can usually change a meal to fit a customer’s needs. 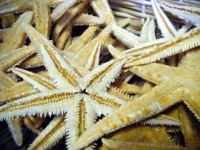 After eating, browse the only Indian Rocks Beach shell shop, located in Kooky Coconut. 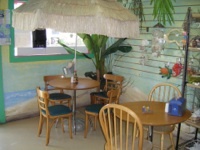 Then head out the back entrance to the beach and relax in complimentary beach chairs. Our entire menu is available for pick-up! Call ahead at (727) 517-1300.